Early 20th century single cylinder double-acting air supply hand-pump. Made by Siebe Gorman & Co Submarine Engineers London. 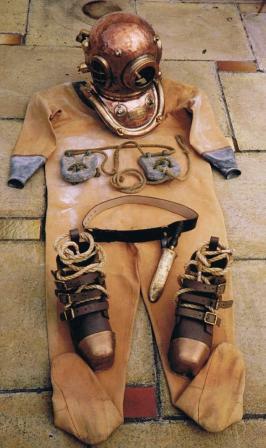 Early 20th century complete professional diving gear made by Siebe Gorman & Co Submarine Engineers London containing; single cylinder double-acting air supply hand-pump, 6-bolt copper helmet and corselet with matching number 14616, matching twill suit, front and back lead weights, knife with wooden handle and brass sheat mounted on leather belt, lead boots with brass toe caps and laces, jock strap with brass hangers, air line 50ft., corselet “T” spanner and air line spanner as well as telephone cable 200ft. with sealing caps. Early 20th century complete professional diving gear. 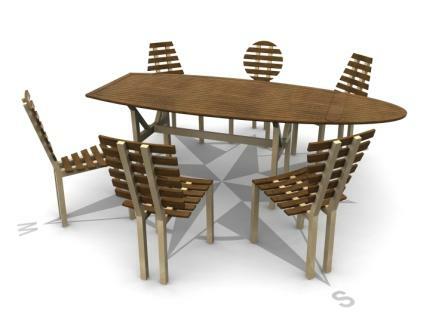 Made by Siebe Gorman London. Early 20th century Danish four-light copper diving helmet. Early 20th century three-light copper diving helmet. Manufacturer unknown. Early 20th century U.S. shallow water brass diving helmet. Made by Snead Co., Jersey – City N.J.
Danish 2-bolt/four-light copper diving helmet. Marked H. Christiansen, København. Early 20th century diving phone in original oak case. Early 20th century single diving shoe. 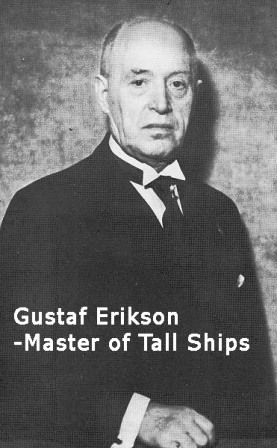 Made by Emil Andersson (E.A.) Sweden. Leather, lead sole and brass shod. 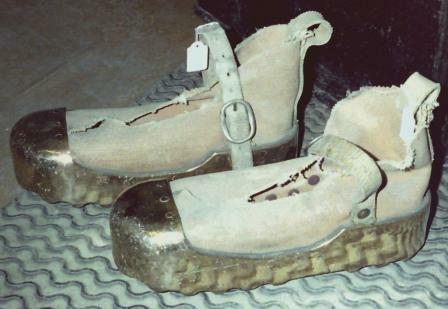 A pair of 20th century Russian diving shoes (Soviet Union). Lead soles, canvas and brass shod. A pair of early 20th century Italian diving shoes in solid brass. 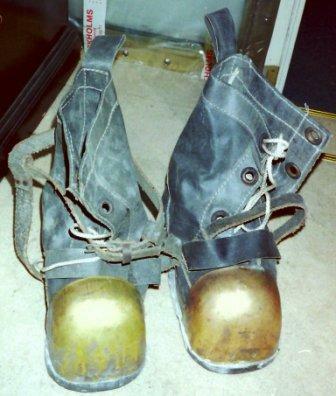 A pair of early 20th century diving shoes made by Siebe Gorman. Leather, lead soles and brass shod. 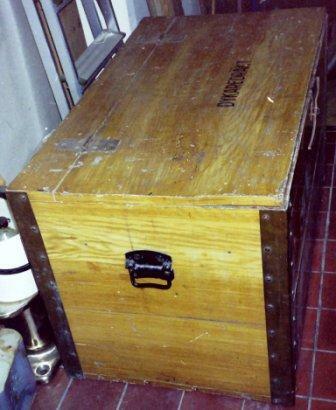 Early 20th century Swedish diving equipment chest. A pair of 20th century cuff spoons. Brass, rubber-dressed handles. Made by Siebe Gorman. 20th century diving knife made by Heinke, London. In brass with single edged blade. 20th century diving knife made by Siebe Gorman & Co. Bakelite handle, leather strap, brass sheat and double-edged blade. 20th century screw-in type German diving knife. Made of brass with single edge stainless blade. 20th century non-magnetic diving knife made by Siebe Gorman & Co. Wooden handle, leather strap, brass sheath and double-edged blade. 20th century screw-in type diving knife made by Siebe & Gorman. Wooden handle, brass sheath and double-edged blade. and rubber-dressed handle. Leather and brass buckle. 20th century diving knife made in the USSR. Brass sheath and rubber-dressed handle. Leather and aluminum buckle. 20th century diving knife made in the USSR. Brass sheath, antimagnetic single edged blade and rubber-dressed handle. Leather and brass buckle. 20th century diving knife made by C.E. Heinke & Co. Ltd, London. In brass with double edged blade. 20th century Siebe Gorman ”shortsword”, ex- British Royal Navy Standard (Hard Hat) Diver's Knife, complete with original leather belt loop and brass securing bolt. 20th century diving knife made by C.E. Heinke & Co. Ltd/Siebe Gorman, London. Double edged blade. 20th century diving knife made in GDR (DDR), German Democratic Republic. Brass sheath and wooden/brass handle. Leather and brass buckle. 20th century underwater flashlight made of brass. Made by Siebe Heinke of England 1969, marked both with NSN-6230-99-520-1611 and Ap. No. 0563 / 202927. 20th century screw-in type Polish diving knife. Wooden handle, brass sheath and single edged stainless blade. 20th century screw-in type diving knife made by Desco. With saw-tooth edge on one side. Brass sheath and wooden handle. 20th century Siebe Gorman front and back led weights. Bolt-gun in brass and metal marked CCCP No 037. Made in the Soviet Union/USSR in 1946. 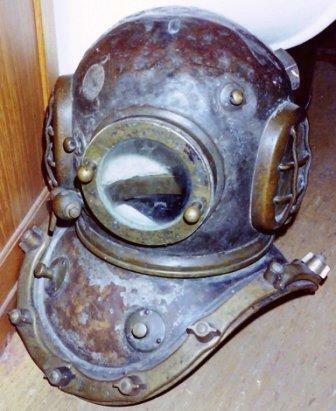 Early 20th century 12 bolt/three-light copper diving helmet. Manufacturer unknown. 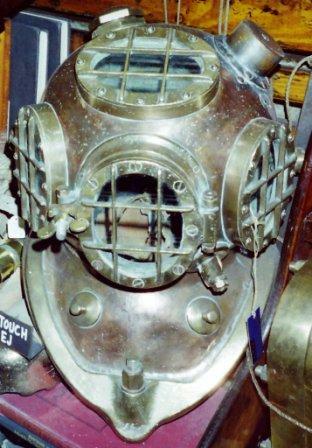 20th century 12 bolt/three-light copper diving helmet. Manufactured in the USSR in 1977. "Tauchertechnik" by Hermann Stelzner. German manual for deep sea divers. Facsimile of the original published in 1931. 404 pages. 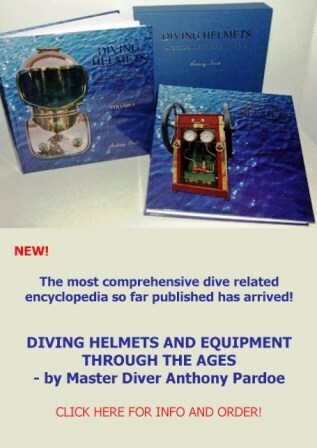 "Helmets of the deep" by Leon G. Lyons. No 886/900. Published 1988, 370 pages. "Deep diving and submarine operations" by Robert H. Davis. 2 volumes of the limited edition (No 116/1500) of Siebe Gormans 175th year anniversary box. 9th edition, published 1995. 693 pages. 20th century Russian diving watch, no 8476 in original box. Incl description and certificate dated 1968. "Dykeritjänstinstruktion för marinen". Diving instructions published by the Swedish Navy in 1953. Volyme III, IV, V & VII. 20th century diving inclinometer made of brass. Made in the USSR in 1978. "Dykare och vrak i våra vatten, sjöhistorisk årsbok 1975-76." Yearbook regarding divers and wrecks in local waters, published by the Maritime Museum Stockholm in 1977. In Swedish, 160 pages. "Kongl. Maj:ts rådige protectorial för dykerie interessenterne och deras betiente." Proclamation issued October 1730 by His Majesty the King of Sweden regarding diving related issues. 7 pages. "Kongl. Maj:ts rådige förordning om dykeriet." Regulation issued November 1734 by His Majesty the King of Sweden regarding diving related issues. 8 pages. "Kongl. Maj:ts ytterligare rådige förordning angående Dykerie och Bergningswärket." Regulation issued September 1741 by His Majesty the King of Sweden regarding diving and salvaging related issues. 7 pages. 20th century electrified diving lamp made by Siebe Gorman. 20th century hand-held electrified diving lamp. 20th century German compressed air distribution panel made by Drägerwerk AG, Lübeck. Able to connect two divers. "Hard-hat returns from Neptun's World." 20th century model depicting professional diver equipped with Swedish diving gear. Size: Diameter 20cm, Height 21cm. "Professional hard-hat diver at work." Depicting late 18th century salvage of naval cannons. Divers crown-marked half pint beer glass with beautifully engraved traditional hard-hat. Divers long-drink glass with beautifully engraved traditional hard-hat.